Created and performed by Londs Reuter and friends, Private Inventory or No Health Insurance is a thinking, moving, and writing-it-down practice that looks more at what choreographs us than what we choreograph. Private Inventory attempts to translate non-verbal, embodied self-knowledge acquired through dancing into written record. From movement practices, we generate writings, surveys, anecdotes, and charts to map out the particularities and generalities of a dancing body. Private Inventory or No Health Insurance assumes that there is no normative body and that we’re all carving out unique ways of moving through the world at all times. 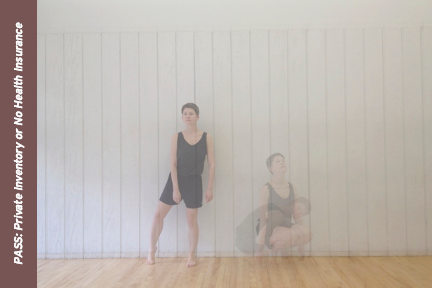 PASS is a curated performance series that takes place at Snug Harbor’s Newhouse Center for Contemporary Art and Dance Center. The salon’s focus is on original works in performing arts (music, dance, theater, and multi-media) in different stages of development. These works-in-progress are the culmination of a one-month residency at Snug Harbor Cultural Center & Botanical Garden. PASS is curated by Melissa West, Vice President of Curation.